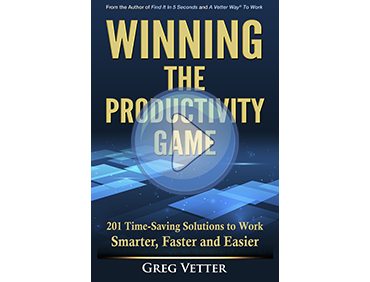 FACILITATOR TRAINING | Vetter Productivity, Inc. The facilitator training is highly comprehensive with the facilitators experiencing the training as both participant and trainer. Facilitators participate in an initial five-day training along with 10 participants from your organization. This allows them to experience the process as a participant. Greg Vetter leads the training. Each facilitator will receive his/her own facilitation manual. A PowerPoint program for the Two-day workshop and the 1 on 1 training will be provided to assist each facilitator with their training. Additional sets may be leased during your licensing period. Updates to the materials will be provided. 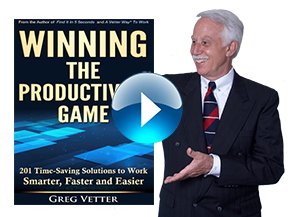 A Facilitator manual directing you through all phases of leading and teaching the A Vetter Way® organizational system. Workbook (utilized when participating in theTwo-day workshop). A certificate acknowledging that you have been certified to teach the A Vetter Way® organizational system. Unlimited phone time with Greg with your facilitators is included while you are licensed. The facilitator training takes place at your organization.